It's the frog on a jet-rocket log versus the dog on the jet-rocket cog! Who will win the race around the bog? 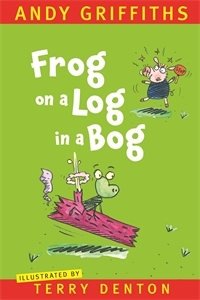 A rhyming story of hijinks and hilarity that will delight Andy fans, especially beginner readers, accompanied by Terry Denton's energetically comic illustrations. This story first appeared in The Cat on the Mat is Flat, which featured a collection of short stories. The original black and white illustrations are now in colour, and the story has been redesigned in a larger format. Der Tag an dem mein Arsch verrückt geworden ist – Evil Lynns WTF!? !